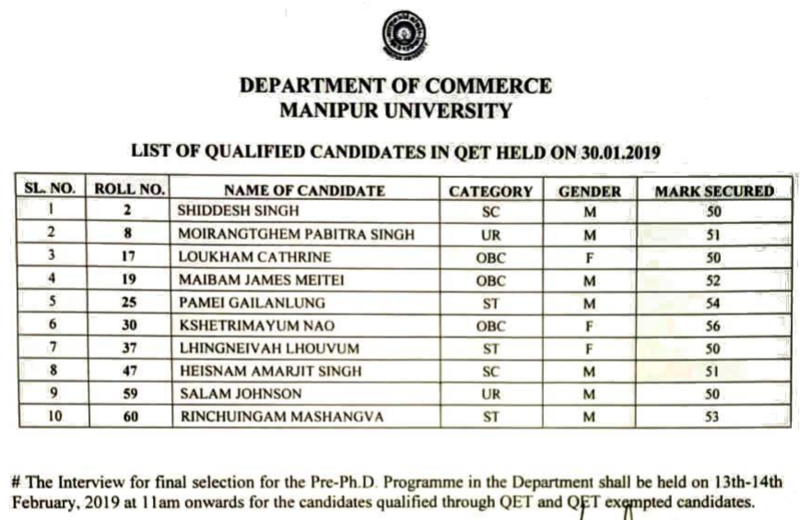 The Department of Commerce, Manipur University has released the result of the QET for selection for the Pre-PhD Programme in the Department. The QET was held on 30th Jan 2019. It has also been informed that the interview for final selection for the Pre-PhD Programme in the Department will be held on 13 & 14 Feb 2019 at 11 am on wards for the candidates qualified through QET and QET exempted candidates. Candidates who have passed the PG examination in the concerned /allied subject with 55% marks or above /B Grade in the seven point scale or above (50% marks for SC/ST) and those who have appeared the qualifying examination and waiting for results are eligible to apply for provisional admission into Pre-Ph.D. Programme.